Short drive to Coachella / Stagecoach music festivals, Indian Wells Tennis Tourney - BNP Paribas, Hard Rock Hotel Pool Party, Humana Challenge, Splash House. Featuring 4 bedrooms/2 bathrooms, a huge family room with vaulted cathedral ceiling, spacious kitchen with island, and dining area. The 2,200 sq ft home is tastefully decorated by an interior designer, featuring upgraded 18' floor tiling, comfortable furniture, fresh paint and quality linens. Free WiFi. The living room, kitchen and master bedroom all lead out to a large Covered Patio, adjacent to the Saltwater Pool/Spa. During the day, the Teak Chaise loungers are a great place to comfortably soak up the sun. The covered patio features a dining area with a Dining Set for 6 and Teak Serving Bar, plus a small Weber charcoal grill. The wicker Conversation Set and inviting Firepit is a great place to enjoy a view of the pool and mountains. Perfect for evening relaxation! The attractive entry flows from spacious living room directly into the dining room in this exceptional one-story plan. The split configuration allows for privacy for everyone. The Master Suite is to the east off the great room, the 2nd and 3rd bedrooms are to the west, and the 4th is located north off the great room. Oversize tile is standard in all bathrooms, throughout the great room and in the kitchen. The living room features an entertainment center with flatscreen streaming TV & DVD player, and a media library with hundreds of movies, including many children's titles. The fireplace is adjacent to the entertainment center. With a large sectional sofa and armchairs, there is lots of room for relaxing. The kitchen is fully outfitted with Stainless appliances, kitchen island, microwave, coffee maker & toaster. Everything needed to entertain is available, including a large dinnerware and flatware set, knives, mixer, pots & pans and bakeware. The large wood Dining table comfortably seats ten. The Master Suite has a comfortable Sealy Pillowtop Cal King bed, 400 thread count sheets, a 1080 HD flat screen TV and DVD, a custom tiled en-suite bathroom with large bathtub/shower, and a huge walk-in closet. The Second Bedroom also has a Queen pillowtop bed and TV, as well as a large double mirrored closet. The Third Bedroom has a Twin bed and a Twin trundle bed, and TV, as well as a large double mirrored closet. Both 2nd, 3rd and 4th bedrooms share the adjacent 2nd bathroom. There's lots of fun for the kids inside, in addition to the outdoor activities. The great room has a multi-game table, with pool and air hockey plus a great variety of DVDs for kids of all ages. In the 4th bedroom there's also an X-box with a variety of games. And speaking of things for kids, please note this home comes with a new Graco Pack 'n Play, Highchair and Umbrella Stroller to help make your packing a little lighter, as well as step stools in both bathrooms. Garage is not accessible to renters, but there's room for 3 cars on the driveway, and Secured offstreet/RV parking in the side yard. A short walk from the house takes you to a large park, with BMX ramps, kids play equipment, sport courts and walking paths. The home is located just 15 minutes from Palm Springs, and close to fabulous restaurants, wonderful designer outlet shops at Cabizon, casinos, street fairs (Thursday), flea markets (Saturday and Sunday), museums, music, movies, and theater. Great golfing is nearby at many locations, including the renowned Mission Lakes in Desert Hot Springs. Joshua Tree National park is 15 minutes away, with great walking/hiking and beautiful scenery. The home is located just 2 hours from Disneyland, Hollywood & San Diego, and 4 hours from Las Vegas. We are a family with two growing boys and a little girl, and love to spend time together doing activities and relaxing. We love the desert as a vacation spot for our family. Our family and friends enjoy swimming, walking/hiking trails, dining at the great restaurants nearby, golf and relaxing. 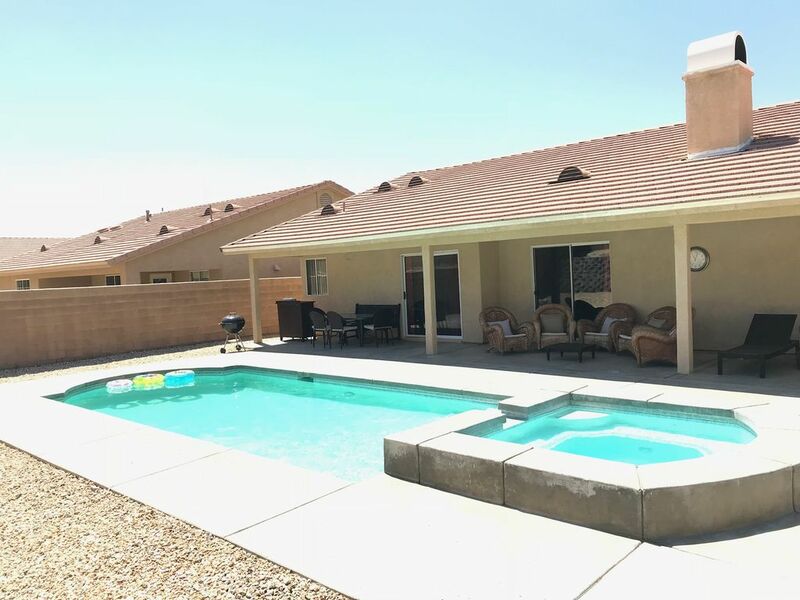 Desert Hot Springs is close to everything including the city of Palm Springs and we find that we have all we need for a great vacation at our vacation rental home. The view of the mountains and the stars at night is gorgeous. We love it, and you will too! The greatest thing about our vacation house is the space. We like to invite friends and family to join us, and the house and backyard is very spacious so there's plenty of room for us all. Our favorite thing to do at our vacation home is use the private saltwater pool and spa. For dinner we like to BBQ using the charcoal grill, and put on the firepit, which really extends the evenings. The view of the mountains and the stars at night is spectacular from our backyard. Close by are lots of activities including golf, hiking in Joshua Tree, great shopping and lots of choices for casual dining or fine dining. Views of pool and spa from the Master Bedroom, Living Room and Kitchen. New washing machine and dryer are located in the Laundry Room, off the Great Room. The Stainless fridge freezer is a large side-by-side style. The basics are all stocked, including coffee/tea, sodas and filtered water, salt and pepper and seasonings. We have a large collection of DVDs for Adults and Children. The bookcase has an assortment of fiction and local interest books, for adults and kids, as well as maps and brochures for local events. Family board games, jigsaw puzzles and card games can be found in the bookcase. There’s also a multi game table, with air hockey and pool. There are pool toys in the laundry room, and games and toys in the bookcase and kids bedroom. (20) Many x-box games are available. Our covered patio has a dining set and serving island, a wicker conversation set, and lounge chairs, all overlooking the pool/spa. There is also a fire-pit for chilly winter evenings. Our gorgeous pool and spa are completely private. The family room, kitchen and master all overlook the pool with access via patio doors. The private hot tub/spa is outside, adjacent to the pool. The kitchen has a coffee maker, toaster, microwave, kitchen blender, knives and utensils, as well as standard kitchen appliances and dishware/flatware. We provide coffee, tea and sugar/creamer, and leave filtered water, soda and other refreshments in the fridge. The bathrooms have a hairdryer and hair iron, shampoo, body wash, toothpaste and there is an iron/board & clothes hangers. There's also a new washing machine and dryer in the laundry room. We provide WiFi, phone with free long-distance calling, local TV with flatscreen TVs in most rooms. On the covered patio is a BBQ/Grill, an outdoor firepit, to be used with duraflame logs, a outdoor dining set for 6 and a wicker conversational set. Instructions were outstanding and a very comfortable home. All the amenities one needs. Nice to have some beverages on arrival! Great place for a family to unwind and get to see the sights around Palm Springs. The house was perfect for our family. Kerrie had drinks in the fridge which was a lovely touch. The house was spacious, clean and had everything you needed. The kids loved the pool. Would stay again. This vacation home was very clean and it had everything that you possibly need. Kerri was very accommodating and had allowed us to change our schedule so easily. We received answers to all of our questions promptly. Thank you so much for being a great host! We shared this house with two families and it worked out great! All the adults and kids had bedroom space and a great big common area to hang out together. The host has clearly put a lot of thought into including everything one could want and need, from a well-stocked kitchen, to swim towels, to books, games and multiple t.v.s. The home was fully equipped and very comfortable for our family of six over the holidays. Kerrie was quick to respond if we had questions/concerns. Hikes in the nearby parks were delightful. Rate includes Pool/Spa heat of 6 hours a day is included. $30 fee per day for extra heating. Rate quoted is for groups up to 8 people. Refundable security deposit is $250.00 Cleaning fee is $199.00 90 day cancellation notice needed for full refund.